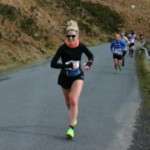 Congratulations to Gemma Mallett on a magnificent performance to win the prestigious Rhayader 20 mile race. Gemma led the women’s race from the early stages and looked cool and totally in control as she proceeded to extend her lead to finally win the tough road race by nearly 7 and a half minutes from the second placed runner, who was wearing an England international vest. Gemma’s winning time was an outstanding 2.24.40. 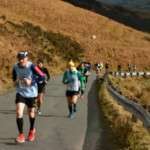 I had seen, on the Rhayader A.C. website, that there was a covering of snow at the highest point of the course at the 4 mile mark in the early morning. So I decided to head over to the Elan Valley (one of my favourite places) to enjoy a short stroll in the snowy hills before cheering on the Croft contingent of runners. Most of the snow had vanished by the time I arrived, but I was still able to enjoy my trek. Is there a more scenic course for a road race anywhere in the UK ? I first positioned myself just below the 4 mile stage , with the snow-flecked hills above and the tumbling white water cascades and waterfalls of Nant Gwynllyn below. At this point the runners had already climbed about 3 miles with more climbing ahead and fatigue was already evident on the faces of some of the intrepid athletes. It is doubtful that many of the runners were enjoying the spectacular scenery as I was able to, due to being deep in concentration and hoping that each bend in the road would herald the summit of the limb-aching climb. One female runner called out to me “Are we there yet ?” I had my camera poised wondering which of the Croft runners would arrive first. Glyn, Greg and Nigel were running the race as part of their preparation for their spring marathons – Glyn and Nigel in London and Greg in Brighton. I almost missed Gemma, who surprised me as the first to appear – I had been looking for the Croft sky blue vest, but Gemma was the dark destroyer dressed all in black. Unfortunately, my old camera was suffering from a system malfunction (or was it human error on my part ?) and almost all of my photos. were blurred. Previously taken scenery shots had featured well. Apologies to the Croft runners for my inability to capture their race, and to Gemma in particular for not providing a record of her moment of glory. The runners, at that stage, were still fairly closely packed so I wasn’t sure whether Gemma was the leading female, but she looked comfortable and full of running. I then headed to a new stage of the course where the runners crossed the Caban-Coch bridge on a short out and back section. Again I had selected a position where I could photograph the runners crossing the bridge, with the green dome of the reservoir inspection tower and the snow-capped hills as a background – sadly, the same negative result. I was, however, delighted to confirm that Gemma was, indeed, leading the women’s race and looking good. Greg was leading the trio of male Crofters with Glyn and Nigel in pursuit and all were looking reasonably fresh. Back to the outskirts of Rhayader, I witnessed Gemma still running smoothly and finishing 45th overall and all the Crofters moving well. Camera still misbehaving ! The clear race winner was Andrew Tuckey (Bridgend A.C.) in 2.00.23. Greg recorded 2.30.42 (in 57th place), Glyn 2.36.07 (79th) and Nigel 2.39.43 (100th). They probably found the course a bit of a doddle compared to some of the mountainous training routes that Glyn had pushed them over in recent weeks. Sam the Man and Steph opted for the easier (and less scenic) 5 mile race, with Sam finishing 8th in 31.18 and Steph 8th female in 36.10. The day recalled some painful memories for me from decades ago. I will be a bit self-indulgent in re-living those occasions as I meander down memory lane ….. In all my running career I only ever came to a stop twice – one was in the London Marathon in 1986 when I was in the form of my life and flew through 20 miles in 1.56 in the hope of breaking 2.30. I developed severe cramp in my hamstring and it took me nearly an hour to complete the final 6 miles. A lesson learned ? No. I first ran the Rhayader 20 in 1987 and, although I suffered a bit (I usually avoided hilly courses), I was pleased to break the 2 hour barrier. It was later announced, however, that the course was nearly a mile short ! I returned in 1989 when the course had been properly measured and lengthened. I was still deluded and believed that I could still run sub 2 hours – there is a pattern of over-ambitious and unrealistic conduct developing here. The climb up the Old Mountain Road went steadily as I tried to stick close to 6 minute mile pace. I paid the price for this extravagance when I came to an abrupt halt on the final hill just after 18 miles. My running diary records : “Bang ! Hit the wall with a vengeance. Just wanted a lift to the finish.” Runners were passing me, but I didn’t care until a Hereford Courier overtook me. This roused me from my self pity and defeatism. I wasn’t going to let him beat me ! I pushed myself to the finish line to register 19th place in 2.05.44 (that would have placed me 2nd this year !) to discover that Keith Hiley (Croft’s top road runner in those days) had suffered a similar fate. He finished 18th and I found him being treated for exhaustion in an ambulance. There was an extensive prize list and, as 4th veteran home, I won a rather snazzy wristwatch (which I still have somewhere). I suppose that I did learn from these experiences as I never ran another marathon or 20 mile race – a victim of my own cocky ambitions. Gemma puts me to shame – she recently ran 6 marathons in 6 days ! She appears to be thriving on the challenge and she is much better looking than I ever was. This is a great and well organised race for anyone who likes challenging distance races. I too enjoyed being a spectator, they all did brilliantly – well done! great stories there, full of human content and inspiration..thanks for being open!! The round the lakes sounds like a great race…I have only ever walked, cycled and drove it..about time to run it. Outstanding result Gemma, just hope your around for the summer league. Well done to all who took part. Fantastic, that’s what you get for a bit of talent and a lot of hard work.